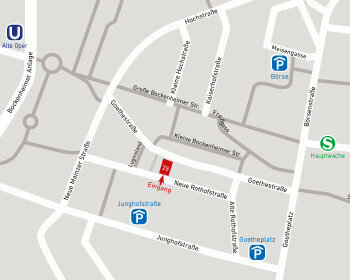 It is easy and seamless to get to Padilla Dental Care Clinic in Goethstraße 25, Frankfurt, by public transport or car. The Clinic is located in Frankfurt downtown, in Goethestraße 25 nearby Hauptwache and Zeil area. Public transport, metro “U” or by train are the many ways to get to Goethestraße 25. Take the metro “U” (U6 or U7) and get out at Hauptwache station. Otherwise, you can take trains “S” passing by the Hauptwache Station. Get out there and look for the exit (AUSGANG FressGASSE/GOETHESTRAßE) and walk down the street until Goethestraße 25. One finds elevators at level “A” to BIEBERGASSE and at level “B” in HAUPTWACHE PASSAGE. Likewise, one can take the U6 or U7 until Alte Oper station. From there it is a 5 minute- walk to Padilla Dental Care Clinic. Just look for the exit Alte Oper / Fressgasse and, once you get out, turn right to Goethestraße, walk down the street and you will find us on the right side through the passage. How to the get here by car? It is difficult for car drivers to find a parking place in Frankfurt downtown. You better get into one of the parking buildings surrounding the Goethestraße: Parkhaus Goetheplatz y Parkhaus Junghofstraße, or even City-Parkhaus Börse. 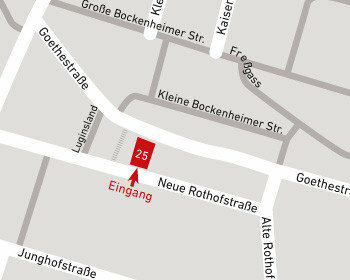 From Parkhaus Goetheplatz, just take the exit Ausgang Steinweg/Hauptwache right in front of the Goethestraße and the entrance to our clinic through the new street Neue Rothofstraße. 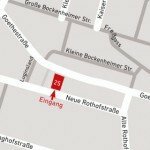 Due to building works in the Goethestraße 25, a new entrance to Padilla Dental Clinic was created on the new street NEU ROTHOFSTRAße 18 side. If you are heading from downtown, look for Hermes store in the Goethestraße 25, do an U Turn through the passage and you will get in the Neu Rothofstraße.